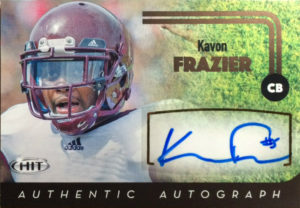 A traditional in the box safety, Kavon Frazier really knew how to lay down the wood at Central Michigan. His best year for the Chippewas happened as a Senior when Kavon posted 108 tackles, 4.5 tackles for a loss, a pick and 4 passes defensed. He’d be selected by the Dallas Cowboys in the 6th round of the 2016 NFL Draft. Kavon fits in well with the Cowboys defensive alignment and has slowly worked his way up from special teams. With free agency decimating the Cowboys secondary in 2017, Kavon had to step it up a notch. He finished 2017 with 33 combined tackles and a forced fumble, and started his first two contests in 2018.